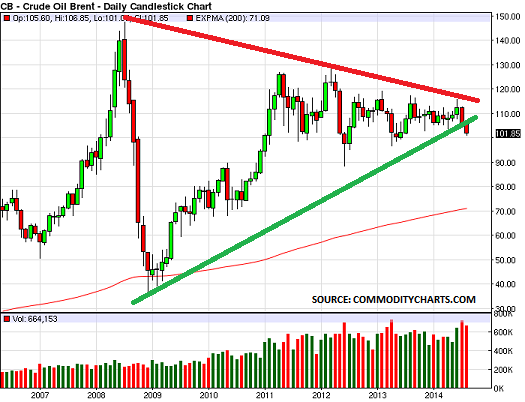 The key factor, as I learnt when trading in oil and product markets in Houston, Texas for ICI is that “the trend is your friend“. Traders will delight in short-term volatility, and try to catch the various up and down movements. Genuine investors will ignore these and instead focus on the long-term trend. 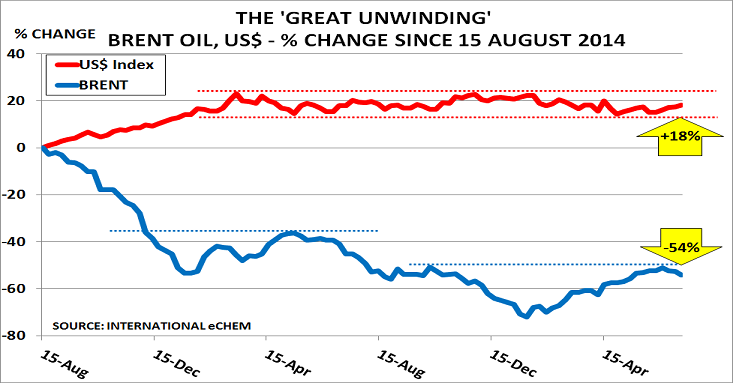 For them, the Great Unwinding concept has been very helpful in understanding the outlook for oil and the US$ – the 2 key components of the Unwinding. “The result, as the IEA note, is that we suddenly find we face a supply glut. There was never any real logic behind the story that the US drilling rig decline would lead to lower oil production, or that an OPEC/Russia production freeze would cause markets to rebalance. But in today’s world of high-frequency trading, driven by algorithms, most traders focus on making a quick profit rather than logic. Many senior oil company executives are also happy to talk the market up, hoping this will boost their company’s share price. “The levels of diesel, gasoline and heating oil in storage tanks in Europe this week are so high they are causing delivery backlogs and are casting doubt on whether demand for oil to be refined can be sustained….storage tanks for diesel and heating oil are already so full in Germany, Europe’s largest diesel consumer, that barges looking to discharge their oil product cargoes along the Rhine are being delayed, sources told Reuters…. The US$ looks similarly ready to make a move out of its tramlines, as the Eurozone debt crisis re-emerges into public view. The key is the Italian banking system, which appears close to collapse. I will look at this shortly. 2015 was the year when companies and markets began to feel the impact of the Great Unwinding of stimulus policies. The blog’s readership has increased significantly as a result, as people began to abandon the consensus wisdom which had so clearly failed – once again – to provide a reliable guide to the outlook. “China’s economy is in dire need of a makeover. Instead of working on the demand side, attention has turned to stimulating business through tax cuts, entrepreneurship and innovation while phasing out excess capacity resulting from the previous stimulus. Such measures are intended to increase the supply of goods and services, consequently lowering prices and boosting consumption. Understanding these developments, and their impact on the global economy, will be a key theme in 2016 for my new pH Report subscription service, which has had an encouraging first year. I hope you might consider subscribing. Thank you also for your continued support for the blog. Its audience continues to grow, as shown in the chart above, with its visits now totalling 380k. Its readership includes 186 countries and over 10k cities. Readers also remain very loyal, with one in two reading it every week, and one in four reading it every day. 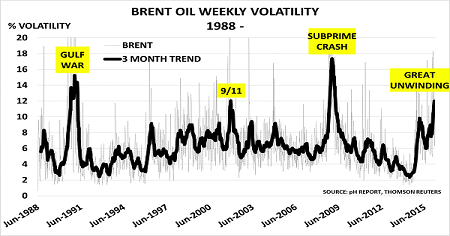 There have been 35 “flash crashes” in US oil markets so far this year, when prices swung up or down by 200 basis points (2%) – before reversing the move by > 0.75%. That’s 35 occasions when the markets were out of control. It is tempting to blame this on misfiring algorithms at the high-frequency traders. Regulators have been asleep at the wheel, and allowed them to dominate energy markets (and most other major financial markets). They are now responsible for half of all energy trading each day. Now the Great Unwinding of these policies is underway, and all this excess capacity will force companies to compete fiercely on price and battle for market share. Even worse is the risk that, unlike in the past, demand may never catch up with all this new supply. It will take decades for the supposed ‘middle class’ in emerging economies to actually become middle class – if all goes well. And it would take 25 years for new babies to grow up and become Wealth Creators, even if women suddenly started tomorrow to reverse the decline in fertility rates and have more babies. And this is where the problem of those ‘flash crashes’ becomes serious. It seems very unlikely that policymakers outside China will suddenly realise the error of their ways, and abandon stimulus. Far more likely, as the European Central Bank suggested last week, that they will do more and more stimulus to try and hide the failure of their policies. So markets will be pushed higher by the lure of unlimited amounts of free money from the central banks, and then brought low by the return of reality in terms of slowing demand and increasing debt levels. 2016 is critically important for his policies. He is due to seek re-appointment for a second 5-year term in November 2017. And it would make no sense for him to do this with the job half-done. Political necessity suggests he must try to ‘take the pain’ of adjustment by the end of 2016. Then he can approach the November 2017 Plenum with a platform that can not only claim to have resolved the problems he inherited, but also point to the sunlit uplands ahead – as his major initiatives of the Asian Infrastructure Investment Bank and the ‘One Belt, One Road‘ start to become reality. 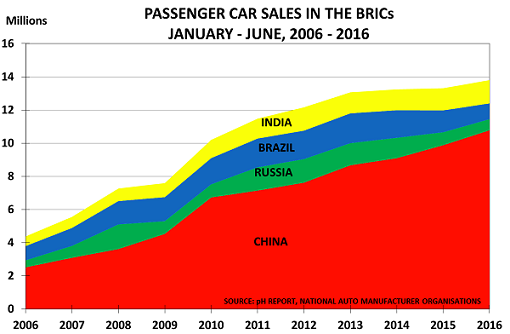 So 2016 will see China putting its foot hard on the brakes of the Old Normal economy – whilst Western policymakers compete to ramp up stimulus to compensate. It could easily prove to be as difficult a year as 2008. Companies owe it to themselves to plan ahead for this Scenario. ’Flash crashes’ take place in a flash, not over months. It could prove too late afterwards to regret that you had failed to put the necessary contingency plan in place. Oil and commodity prices are falling sharply as supply/demand once again becomes the key driver for prices; the US dollar is strengthening and liquidity is tightening across the world; equity markets risk sharp falls, as investors realise they have overpaid for future growth and rush for the exits; China’s economy is slowing fast as the new leadership implements the World Bank’s ‘China 2030’ plan; interest rates are becoming volatile as some investors seek a ‘safe haven’, while others worry that stimulus policy debt may never be repaid. Today, it is clear that risks are rising in all these areas. And fewer people now believe that the problems can be magically wished away by a further round of stimulus – even if this was economically and politically possible. 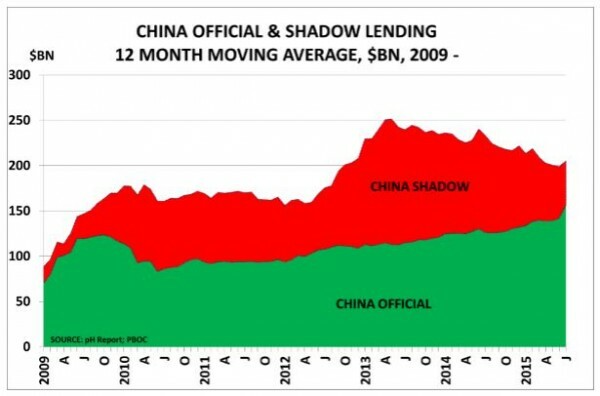 Our view is that markets are beginning to recognise that China fooled the world with its stimulus programme. Contrary to popular belief, China did not suddenly become middle-class by Western standards in 2009. Instead, aided by developed country stimulus, its easy-lending policy created a global commodity super-bubble to rival, and perhaps even exceed, the US dot-com bubble in 2000 and the US subprime bubble in 2008. China’s new leadership have been busy reversing this policy since coming into power in March 2013, following the strategy set out in the ‘China 2030’ plan. In turn, this has turned the world upside-down for commodity exporters, who had borrowed heavily to boost production in order to meet China’s supposedly ever-increasing demand. 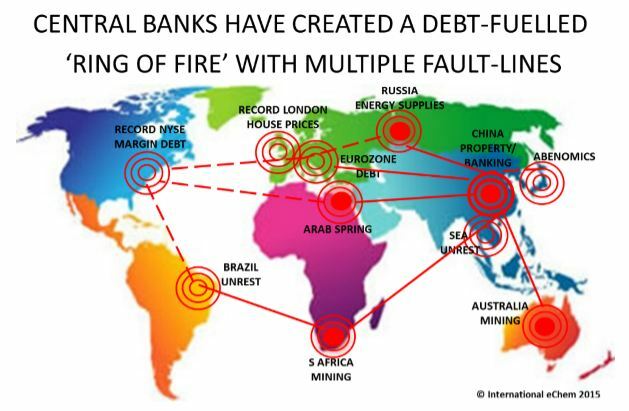 This is now creating a debt-fuelled ‘ring of fire’ connecting Latin America, South Africa and South East Asia with Australia, the Middle East and Russia. It was of course comforting for investors to believe that the start of the downturn in May 2013 was somehow due to a ‘taper tantrum’, caused by a concern that US interest rates might not stay at zero forever. Comforting, but unrealistic. Instead, it was markets starting to recognise that China’s consumption boom was only temporary, and mainly due to government stimulus spending. Understandably, investors had not wanted to ask too many questions about the underpinnings of China’s boom, as this had stabilised global markets and the economy from 2009. But in reality, it was built on a threefold increase in total social financing through state and shadow banks. Official estimates show lending jumped from $83bn in December 2008 to a peak of $252bn in May 2013 (on a 12-month moving average basis). Since then, lending has fallen by nearly a fifth to average just $202bn in July. Bubbles deflate like balloons when the lending that created them starts to reduce. The problem with the lending stimulus was simply that it was unsustainable. By the first quarter of 2013, each $1 of credit was adding the equivalent of just 17 cents to Chinese GDP, down from 29 cents the previous year and 83 cents in 2007. And as the FT noted last October, China’s debt service bill is now running at around 17 per cent of 2015 GDP, or $1.7tn, almost equal to India’s total GDP. Of course, markets and policymakers never move in straight lines. We will almost certainly see further volatility in coming weeks. Many investors have, after all, been taught to ‘buy on the dips’ on the assumption that any downturn will force policymakers to add more stimulus. But the problem with this strategy is that the size of today’s global commodity super-bubble surplus is just too large relative to demand. As the International Energy Agency’s August report noted for oil markets, “global supply continues to grow at a breakneck pace“. As a result, it warned that “2H15 sees supply exceeding demand by 1.4 mb/d, testing storage limits worldwide”. Deflation is looming in the major economies as commodity prices fall and China’s export prices are further reduced by its devaluation. We fear that the end of the commodities super-bubble will lead to major corporate bankruptcies, as occurred at the end of the dot-com and subprime bubbles. We worry that protectionism is likely to spread, as governments become concerned to protect employment. The position is not helped by the high levels of margin debt now existing on the New York Stock Exchange. In real terms, these are higher than at previous margin peaks in 2000 and 2007 – neither of which proved to be good times for buying stocks. Buying on margin is a very dangerous game, as high levels of margin debt create a vicious circle when prices fall. As we have seen in recent days, this means speculators are forced to sell into weakness to meet margin calls from their brokers. Those who have chased London house prices into the stratosphere may come to learn a similar lesson, as the Chinese buyers who have powered demand for new-build houses in the city centre exit their positions.